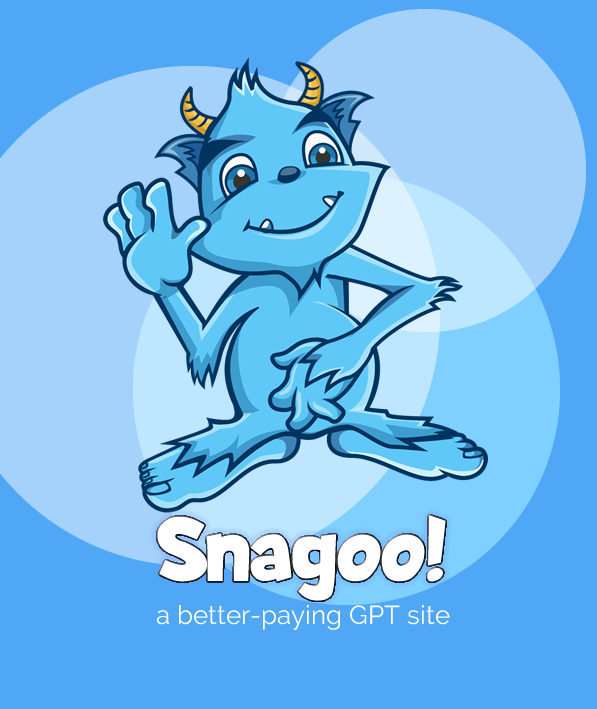 Snagoo: A higher-paying GPT site! You already understand GPT and Offer Walls. Now just get paid more. But we pay out 50-100% more than the big GPT sites! Just like any GPT site, you can earn points in a variety of ways. But on Snagoo, you can earn points up to twice as fast as major brand-name GPT sites. Whereas the big guys pay out between $0.42 and $0.55 per dollar that comes from an offer, Snagoo pays out $0.60 to start and with bonuses pays out up to $0.87. That's more than double the low-end payouts on the big guys' Offer Walls! You can trade points in directly for Gift Cards from Amazon, Starbucks, and more. You can also trade in points for PayPal cash sent directly to your PayPal account. Super low minimums: Trade in as few as 100 points for Amazon Gift Cards or PayPal cash! Ready To Start Snagging Free Stuff?